This time we introduce you our colleague Alicia. 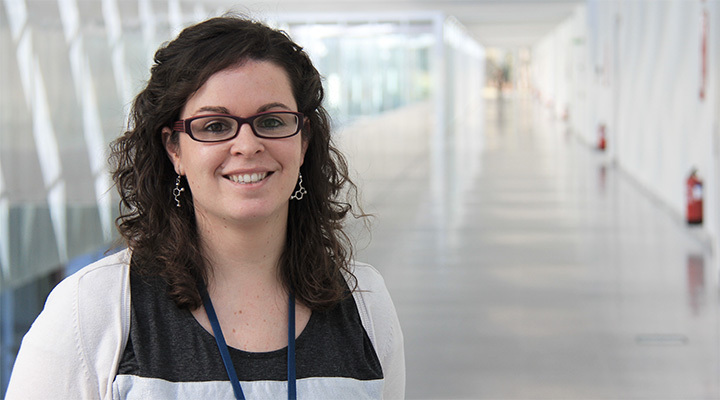 This woman from Extremadura settled in Vigo is a Telecommunication Engineer and Master Degree in European Proposal Preparation and now she’s part of EU Programmes team at Gradiant. In her work day by day, she prepares and follows up on different European research projects, while in her free time she prefers to travel or go out with friends; although her real passion is dancing, a hobby that she has had since she was a child. When I was a little girl, I wanted to be a secretary because I am quite tidy and I love to organize events, meetings or sort documents. I also wanted to be a dancer or an image and sound technician due to connection with dance “performances”. But then I changed my mind from the fifteen or sixteen and it was more or less clear to me that I liked Telecommunications. Since I was a little girl, I always had a predilection for technical subjects, such as mathematics, physics and chemistry or languages. I was not interested in studying a career where I would have to memorize infinite texts such as law or medicine, for example. At first, I wanted to go to Málaga to be an image and sound technician but due to my good marks in school and a little family pressure, I decided to apply for the career of ‘Teleco’ in Seville, where there was a branch of signal processing that had related subjects. Currently I am involved in the preparation of several European proposals on issues such as victim detection, Industry 4.0 or security, using radar, big data or blockchain technologies. What I like most about my job is to be constantly up to date with the latest technologies in various areas, such as security, eLearning or communications. Although I do not know these areas in detail, since my current work is focused on supporting the different areas of Gradiant in different funding calls, I am aware of the advances that are taking place in each sector and what are the current trends. I have always admired my grandmother, for her courage and for the efforts she has made throughout her life to support her family. On a technological level, the truth is that I have no reference, but if I had to choose someone I would name María Salomea Skłodowska-Curie or, as it is popularly known, Marie Curie, for being a pioneering woman in the field of physics and chemistry. I would say them that doing this job is hard and requires effort but, if they like it, I would encourage them to keep fighting for it even if they have ups and downs along the way. On the other hand, I would like to say them that this is a very satisfactory profession with a wide market that allows you to do whatever you like, in the technological field.